St. Paul is poised to join the ranks of major cities, including neighbor Minneapolis, in adopting a $15 minimum wage. Mayor Melvin Carter has said he hopes to sign a law by the end of the year. The City Council should reject calls to exclude young workers from the full $15 minimum wage—or set a lower rate for them—which would harm these workers and their families. While no details on a proposed exemption have been made public, some reports suggest opponents want to allow St. Paul employers to pay workers under 24 a lower minimum wage. This would hurt up to 41,000 young workers in Ramsey County, where St. Paul is located, and place the city at a disadvantage with Minneapolis, which rejected a broad exemption for young workers last year. This fact sheet offers details on why young workers must be fully included in any minimum wage deal, why a lower minimum wage for young workers would harm all St. Paul workers, and why such a proposal should be rejected as a corporate-backed strategy to stall efforts to raise wages more generally. 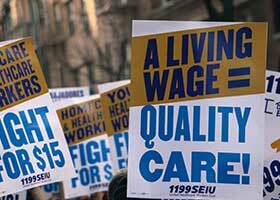 Across the country, young workers in their late teens and early twenties are the typical targets of minimum wage “youth” exemptions or carve-outs by opponents of raising the minimum wage. These workers work side by side with their older counterparts across industries, and they often perform the same work. Minnesota is a national leader in adopting inclusive wage policies. In 1984, the state abolished its subminimum wage for tipped workers, becoming one of seven “one fair wage” states where tipped workers receive the full minimum wage directly from their employers. In 1990, Minnesota also eliminated its teen wage exemption. State law also prohibits age-based discrimination in pay. 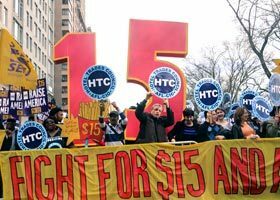 In June 2017, Minneapolis adopted a plan to reach a $15 minimum wage by 2022 (2024 for smaller employers), rejecting proposals for a broad youth exemption. While Minneapolis employers are allowed to pay some young workers a “training wage,” it is limited to workers under 20 years old, for up to 90 days; it must be equal to 85 percent of the full minimum wage, and it can only be used with city-approved programs. The ordinance also classified franchisees as large employers (in order to ensure that they were required to pay $15 by 2022) and removed an exemption that benefited non-hospital residential care facilities. Finally, the city continued its policy of prohibiting employers from taking a “tip credit” to pay a subminimum wage to tipped workers. Business groups, including the Minnesota Chamber of Commerce, challenged the Minneapolis ordinance by suing the city in an attempt to repeal the law, arguing it was preempted by state law. In February 2018, the Hennepin County District Court upheld the ordinance against the challengers. An analysis of public data by the Economic Policy Institute reveals that up to 41,000 young workers (ages 16 to 24) could be positively affected by a higher minimum wage in the St. Paul area. A full 75 percent of these young workers work on average more than 20 hours a week. The data is drawn from Ramsey County, where St. Paul is located, and may include workers who would be indirectly affected by rising wages. Many young workers come from struggling low- and middle-income households, and their earnings provide essential household income. Young workers in St. Paul are no exception. A full 25 percent of young workers in Ramsey County come from households that make less than $25,000. The federal poverty threshold for a family of four is $25,100. Young workers are also often college students who study hard and work long hours to try and cover at least some of their education expenses. In the U.S., nearly 50 percent of students pursuing a two-year degree, and over 40 percent of students pursuing a four-year degree, work more than 35 hours per week. In the St. Paul area, 15 percent of young workers are still in high school, while 40 percent are in college. A higher minimum wage would allow them to cover more of tuition costs, finish school more quickly, and take out fewer loans. 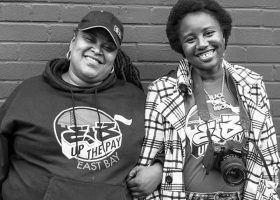 Corporate interests have stalled efforts to adopt a higher minimum wage by calling for a “thorough, measured and inclusive conversation” about exemptions like a youth carve out for the minimum wage. This statement, reasonable on its face, repeats a predictable strategy found in a leaked memo by well-known corporate lobbyist and opponent of raising the minimum wage Rick Berman. 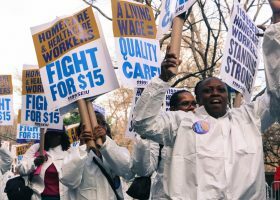 Published in December 2017 by The Intercept, the memo pitches a multi-million-dollar campaign to undermine growing support for a higher minimum wage across the country. A copy of the memo can be found here. 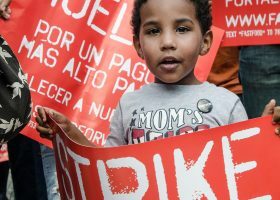 The leaked memo shows that corporations view youth minimum wage exemptions not as a path to better wages for young workers, but as a way to undermine support for higher wages and keep wages low for all workers. This is despite the support of city leaders for an inclusive minimum wage without a tip penalty. 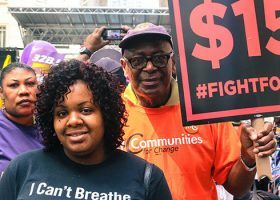 The nonpartisan group Citizens League released a report on the minimum wage in February that gathered community input, including from low-wage workers. Interviewed workers included a cleaner for a large retailer who works five hours a day, seven days a week for $10.75 without benefits or overtime. The report found that “all the low-wage workers [they] met with…are advocating for a minimum wage increase to $15 with the shortest phase-in time possible.” The St. Paul City Council has already spent $60,000 on a series of community meetings to be convened by the Citizens League. The merits of a higher wage have already been debated at length in nearby Minneapolis. Yet the need for a higher minimum wage in St. Paul is even more pressing. According to a February 2017 study by the Metropolitan Council, the regional governing agency, St. Paul has the highest percentage of people living in poverty—40.8 percent—in the entire Twin Cities region. A minimum wage exemption for young workers essentially creates a loophole that would allow fast-food and chain retailers to pay young workers less simply because of their age, and it could incentivize employers to discriminate against older workers. Youth exemptions are often time-limited anywhere from 30 to 120 days, thus encouraging low-wage employers to churn through staff to maintain low wages. For these reasons, cities that have adopted a $15 minimum wage, like San Francisco and Washington, D.C., have no youth or training exception. A youth exemption is plain bad policy—it would exacerbate inequality in St. Paul and punish some of the city’s most vulnerable workers. St. Paul should follow Minneapolis’ lead and ensure that prosperity is shared with all workers.
. Minn. Stat. Ann. § 363A.08.
. Minneapolis, Minn., Code § 40.320 et seq.
. Emma Nelson, op. cit.
. Data was not available for only St. Paul proper. Ramsey County is the smallest geography for which American Community Survey microdata was available. or below 115 percent of the 2017 Minnesota minimum wage after being inflation-adjusted were further adjusted to be at the same position, relative to the minimum wage, as they were in the year that the respondent was surveyed (e.g., someone at 105% of the minimum wage in 2012 would be assigned a wage of 105% of the 2017 state minimum wage).